Three Baby Owls – How Does That Matter? 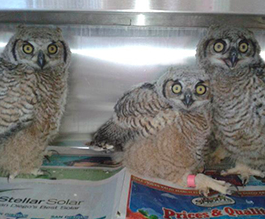 The Fund for Animals took in three young Great Horned Owls since they otherwise would not have survived. In times when daily millions of animals are slaughtered how important is the survival of three animals? As so often, people will tend to be attracted to the fate of the young ones much easier. This interest can then be channeled into something bigger, more important, namely the survival not only of these three babies but their species. The more people get involved emotionally, the better chances are for a multitude to survive.